If you’ve got big, flat, chewy cookies on your mind, here’s a recipe you might enjoy. It makes big, flat chocolate chunk cookies perfect for stuffing with chocolate and nuts. The recipe calls for dark brown sugar rather than light (or a mix of the two) and pastry or cake flour rather than all-purpose. The picture above was made with cake flour, while the picture below was made with Bob’s Red Mill whole wheat pastry flour. For the butter I like using European style, but regular unsalted butter works just fine. Both cookies in the photos were made with store brand butter. Right now this is probably my favorite chocolate chip cookie recipe, and I do hope you try it. Unfortunately, there’s a catch — you really need a scale. You can get by without one, but the cookies might not be exactly the same. Or maybe they’ll be better without the scale. Who knows? I’m just emphasizing that I used the weights rather than the volumes so for accuracy it’s better to weigh. Beat melted butter and sugar in a large bowl with an electric mixer for 1 minute. Let rest for 2 minutes, then beat again for about 30 seconds. Add the egg to the sugar mixture and stir until incorporated, then beat on high speed for 1 minute, scraping the bowl. Beat in the vanilla. Mix together the flour, baking soda and salt, then add the flour mixture and stir to form a soft dough. Stir in the chocolate. Dough should be fairly soft at this point. Chill dough for about 10 minutes or just until it is firm enough to scoop. Scoop about 1/4 cup batter for each cookie onto a couple of foil lined plates or a baking tray (8-10 total). Cover loosely with plastic wrap and chill for two hours or until dough blobs are firm enough so that you can shape them into neater rounds. When they are firm, shape them into neater balls and press down slightly so you have discs. For best results chill over night, or go ahead and bake. Preheat oven to 375°F. Line a large baking sheet with parchment paper. Arrange cookies 3 inches apart on the sheet. Put in the oven. Immediately reduce heat to 325. Set timer for 18 minutes and bake until cookies appear set. 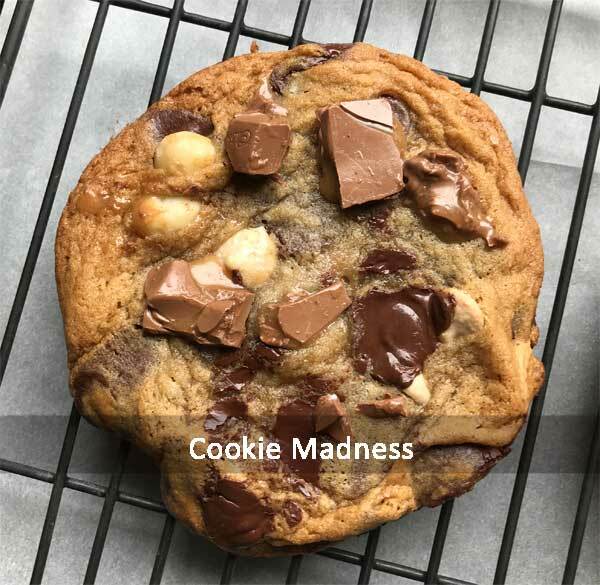 If using milk chocolate, pull from oven and immediately stick milk chocolate pieces into the hot cookies. Let cool on baking sheet for about 5 minutes, then transfer to a wire rack and let cool completely. Note: If you want to make these now and don't have cake flour or pastry flour, you can substitute 1 1/3 cups of all-purpose which should equal about 180 grams. It's always best to weigh it. The reason why you use only 1 1/3 cups of all-purpose rather than 1 1/2 cups of cake is because cake flour weighs less. Made these again. This time I used King Arthur Pastry Flour and Lamd o’Lakes butter. They are still excellent. Such a unique texture. Hope your family enjoys them!! Okay, I made a double batch and the dough is chillin’. Hooray! Glad the recipe worked for you. Oh my goodness! They are so good! They have an entirely unique texture that is wonderful. When I took them out of the oven I was concerned that they were too flat but they’re not. They’re really special. I used cake flour and Lurpak butter. It’s my favorite European butter. Thank you Anna! So much to try something new, unique and wonderfully tasty. Tried to give this five stars but my device is fighting me. I’m very intrigued! I’m not going to be able to make them for awhile but when I do I’ll let you know. They sound wonderful! Angie, did you make them smaller? Just wondering. I haven’t attempted to make them normal size (though I might try it today). I may try dividing one of the chilled dough sections in half. I’ve been making very large ones (8 per batch) and slightly smaller (10 per batch). Thanks for trying the recipe! Also, after making these again with the whole wheat pastry flour I’ve decided I prefer with with cake flour or regular pastry flour (Bob’s sells it in a pink bag). Of course, my family was suspicious since they were not the regular Tollhouse cookie I usually make. They very timidly ate one cookie and before you knew it they had one in each hand!!! Thanks for encouraging me to bake outside the box! That’s a bold statement! Your favorite Chocolate Chip Cookie recipe right now? Of course I have to try these!! You are sweet to say all those nice things, and I’m glad you found the ratios interesting. I sometimes feel like we are all too tied with the idea that we have to use whole eggs, when what I’ve found is that altering the amounts of egg often affects the cookie. So I used 70 grams of eggs and tried to stick with weights. I have a feeling the cookie will get mixed results because people will use volume measurements or the type of brown sugar will be different (too dry, too wet, too brown, etc). So I’m curious to see how these work for others! They’re on the sweet side, but not quite as sweet as the New York Times crinkled chocolate chunk cookies (the banging method). I’ve made them five or six times already. I have come across a lot of “ultimate” and “best” chocolate chip cookie recipes. This recipe took me by surprise. 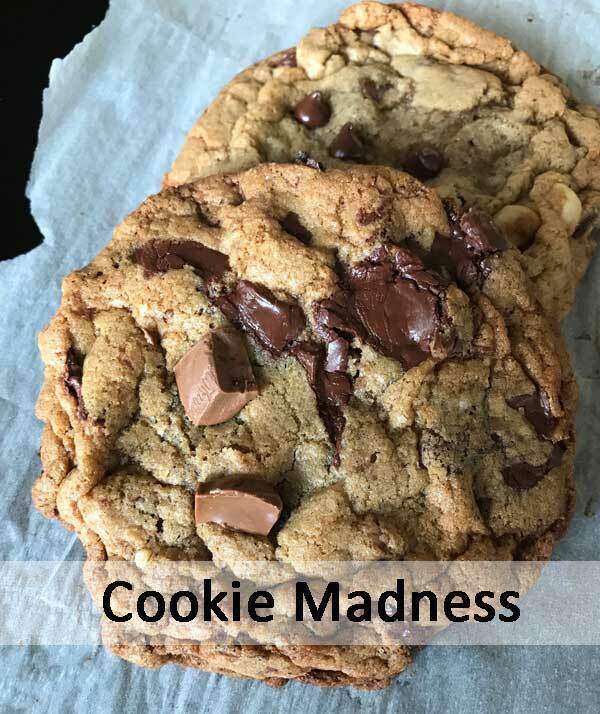 Kudos to you for being so creative and stepping out of the standard “cookie box.” I didn’t think there was another riff to take on the chocolate chip cookie recipe, but you really did it! Thanks for all of the creative effort–from the cake flour to the baking temperature. They look delicious!